Good morning everyone! Thanks for joining me today. This is part three of three of an interview series with Michele Carpenter, the narrator of Zaria Fierce and the Secret of Gloomwood Forest. See the previous parts here and here. To learn more about Zaria Fierce, watch this amazing book trailer Michele put together! Keira (Author): Previously, we talked about your day-to-day routine, but how do you prep for a new project? 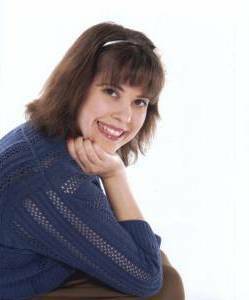 Michele Carpenter (Narrator): Mostly, just by enjoying the book–reading it to myself–but there are times when I’ll have a book with so many characters that I have to write them all out on paper and list personality attributes and a little bit of history for each one. That’s where I would write a description of their accent or voice as well. Sometimes I’m inspired to draw pictures of them sometimes (like with Zaria and Olaf) or make up little songs about them, if I feel moved to. On occasion, I’ll use the spell check function as a way to locate all of the odd words, like fantastical character names or cities and record myself reading them to double check with the author on their pronunciations. If the author wants to give any insights into his/her characters, I always value that as well. Watching movies and TV series can also be really great research for characters, voices, and the current hip lingo, so I do that, while folding laundry, several nights a week as well. Keira: You had a lot of strange names, cities, and places in my story, but you handled them admirably. 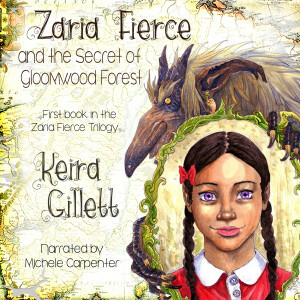 Was there any particular challenge in narrating Zaria Fierce and the Secret of Gloomwood Forest? Michele: Zaria’s four guy friends were a challenge, with their various accents and the need to keep them all unique enough to differentiate. I tried to give Aleks an earthier, Irish-Norwegian accent, because of his being a changeling. Filip, had the higher voice and I gave a more British-Norwegian sound to him. Geirr, I tried to make him sound deeper and a bit prone to being whiny. Oh, and Christoffer was Chinese and an outgoing, goofy personality. Keira: Yes, we changed Christoffer’s voice right at the end of project. He was great before, but now I think he sounds wonderful. His new voice is even more perfect for him. I really love your delivery of his lines in the epilogue. You have great comic timing with your deliveries. I think your performance made the book funnier, sweeter, sadder, etc. Do you do other types of acting? What’s been your most rewarding part to date? Michele: I’d love to be in a local theatre production, but I’m afraid it would be too much of a sacrifice for the rest of my family right now. The most I get to do is an occasional bit of drama for my church. I drive my children to their rehearsals for their production of Disney Jr. Peter Pan. I’m also helping a bit with a youth drama team at my eldest son’s school. I’m pretty sure that most people who know me aren’t aware that acting is what I do for a living, lol! My most rewarding stage performance was probably when I played a French Doll in high school. It was fun pretending to be arrogant and speaking with a snooty French accent. I’m nothing like that in real life. I look forward to where Zaria is going to go, as she comes into her powers and continues to gain confidence. Keira: Thanks! Me too! I’m having a blast working on book two (which for those interested, I’m about to release it on 11/6/2015.) For acting, what is your dream role? Keira: Oh, she most definitely will. What’s an epic fantasy adventure without one? What projects are you working on now? 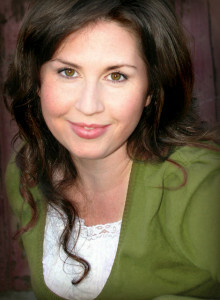 Michele: Having just finished narrating Zaria’s exciting adventures to Gloomwood Forest, I’m going to be working on two other really fun stories. One is to be narrated as a young male (my third boy-voice book). It’s a reverse-werewolf adventure, called Keeper of the Wolves. The other is called Letsi’s Labyrinth—in which a young girl has an adventure that I believe involves meeting a fairy or two. Keira: Ooo, you make me want to go out and grab those books! Until we meet again for the next adventure with Zaria, thank you for all the love and talent you’ve given to her first adventure. Readers, be sure to check out the audio book sample below before you go.